Seoulsome: East Coast: Where to Stay. East Coast: Where to Stay. When visiting the east coast it can be difficult to choose where you want to stay. There are many independantly run pensions, which are similar to a bed and breakfasts. You can check out some of the pensions online through a google search. Or you can check this list of Gangwon-do Pensions. If you are looking for somewhere with more facilities or more luxurious then there a number of hotels in the area too. The Hotel Maremons is located on the east coast of Korea near to the town of Sokcho. The hotel stands on the hill side overlooking the ocean. Deluxe sea-view double room at Hotel Maremons. 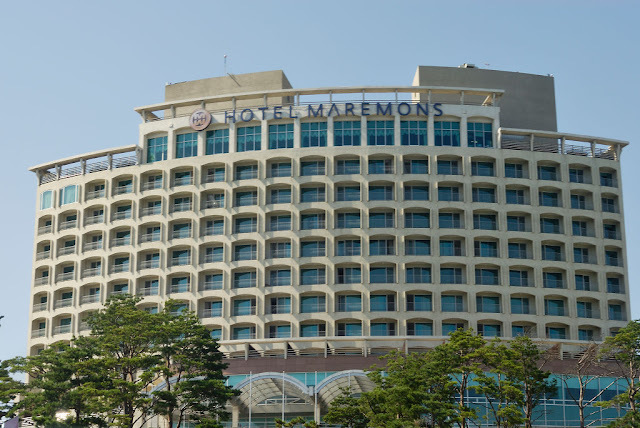 Double room in Hotel Maremons, Sokcho. The rooms are a reasonable size and could sleep three people comfortably. There is one king size bed and a single bed. The room is equipped with a mini-bar, flat screen TV, desktop computer and tea and coffee making facilities. The hotel also provides slippers and bathrobes. Bathroom in the Hotel Maremons, Sokcho. ﻿ The bathroom's are clean and nicely fitted. The hotel provides basic toiletries although these are not in individual bottles but bottles that are re-filled. I found this strange especially as this hotel has a 5 star rating in Korea. There is also a hair-dryer in the bathroom. The sky lounge on the 11th Floor of the Hotel Maremons. The hotel's bar is on the 11th floor offering fantastic views of the coastline. They also have a food menu comprising western and Korean dishes. On some nights they run a dinner buffet which is 25,000 won per person. The food here is of mixed quality. The buffet offers a good selection of appetizer dishes, soup and dessert but was lacking in 'protein' for main course. If you are looking for a good meal and value for money I would recommend trying to find another restaurant. If you are only interested in having a drink then the bar area serves a good selection of cocktails, beer and wine. The cocktails were priced at 8,000 to 9,000 won. Korean beer was 5,500 won. Budweiser beer was 6,500 won. View from the Hotel Maremons. Mountain view from the back of the Hotel Maremons. 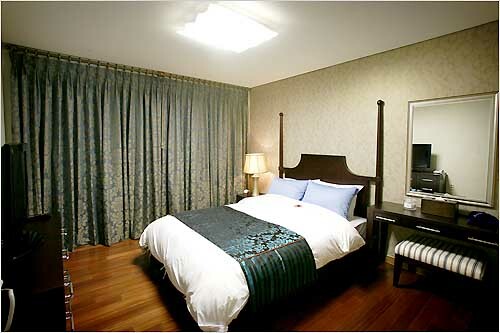 Room prices start at around 70,000 won per night. A deluxe sea view room during the Chuseok holiday period was 125,00 won including breakfast and all taxes. Although this hotel offers a good location right by the beach and the town it is by no means a 5 star hotel as it lists. I would say this hotel is more on par with a 3 star. The rooms are fine though and if you visit outside of peak times it's not bad value for money. Check out Hotel Maremons on Agoda for more pictures, reviews and to find the best price. If you prefer to stay at a something closer to a true 5 star hotel then I would highly recommend the Sol Beach Resort. Although you will pay at least double the rate (doubles start at 142,000 won a night) at Hotel Maremons this hotel is in another league. It has a private beach with direct access from the hotel's manicured grounds. There are also lots of onsite services including five restaurants, two bars, a karaoke bar, children's club, on-site grocery store, souvenir shops, spa and indoor golf range. Sol Beach Resort, Gangwon-do, South Korea. Inside the Sol Beach Resort Hotel. This resort is located a little further south close to Yangyang. The interior of this hotel is much more luxurious and the service is equal to that you would recieve elsewhere in 5 star hotels. The resort also has a small 'waterpark' called Aqua World. Don't get too excited though, it's not the kind of waterpark you're thinking of. It just means lots of pools, spa pools, jacuzzis and water jets. The quality of food in the restaurants here is good and they also offer a buffet dinner. This buffet has a much wider choice although it is priced at 40,000 won per person. For the Hotel Maremons you can find more information and enqire about reservations at the Hotel Maremons website. If you have any questions about either place don't hesitate to ask me. Wherever you choose to stay I hope you have a fantastic time!